Throughout the off-season, the chatter within the Big Blue Nation was more akin to the chatter that preceded the 2011-12 season than the chatter prior to 2010-11 or 2012-13. The Nation anticipated an unveiling of greatness in October and November 2013. After all, the hype about the 2013 incoming class of freshmen was more similar to the hype that ushered the 2011 freshman class onto that big stage of Big Blue Madness. As Big Blue Fans are prone to do, and as this fan admits, we connected dots that probably were too unrelated, too disparate to justify creating an image of another emerging champion, a team that would deliver the Nation's 9 th gate to basketball paradise. Through the first nine games of the 2013-14 season, this team has tasted defeat twice. We recall that in 2009-2010, that group did not taste any defeat (came close a few times) until game 20, after clawing their way to a #1 ranking. In 2011-12, that group did not taste a second defeat until the final game of the SEC Tournament, which they used as a catapult into the Big Dance. They won that Championship. However, in November and December of 2010 and 2012, those teams not only experienced defeat, they experienced defeat twice and thrice, respectively, prior to this early December check point. In the aftermath of Friday night's disappointing loss to Baylor by 5, 67-62, at the AT&T Stadium, Wildcat fans around the globe are wondering if they had connected the wrong set of dots during the last off season. The fan base is now feverishly looking at other dots, previously ignored, to make more sense of this 7-2 start. I read the overnight message board and blog posts on the subject. I make posts of this nature myself. Then I stepped back from the brink of despair to ask how this current group is really doing relative to their last three predecessors. 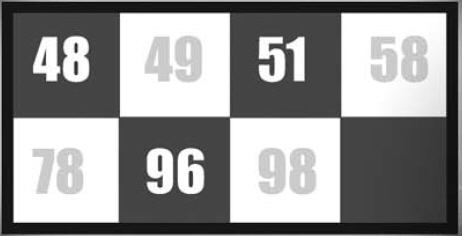 Why the last 3? One of them became the champion that we all hope this group can emulate. 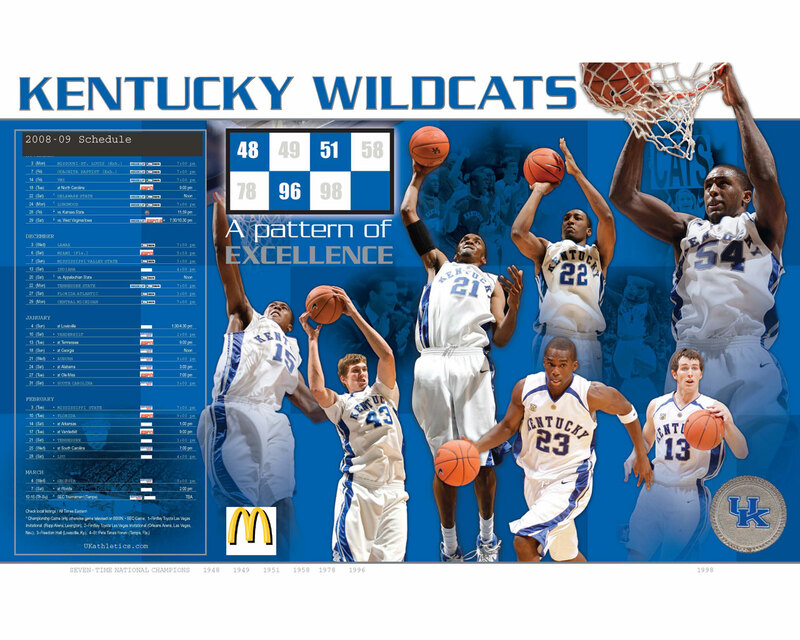 One of them found its identity at the end, in time to give the Big Blue Nation a strong finish that really gave birth to the hope and faith about the upcoming 2011-12 season. One of them ended in a crash and burn scenario after struggling through about 2/3 of their season before its heart and soul went down to a season ending injury. This graph may provide some insight for the Big Blue family about where the current team stands relative to their necessary learning process. The red curve represents the 2011-12 championship season, the green curve represents the 2010-12 season, and the black curve represents the 2012-13 season. 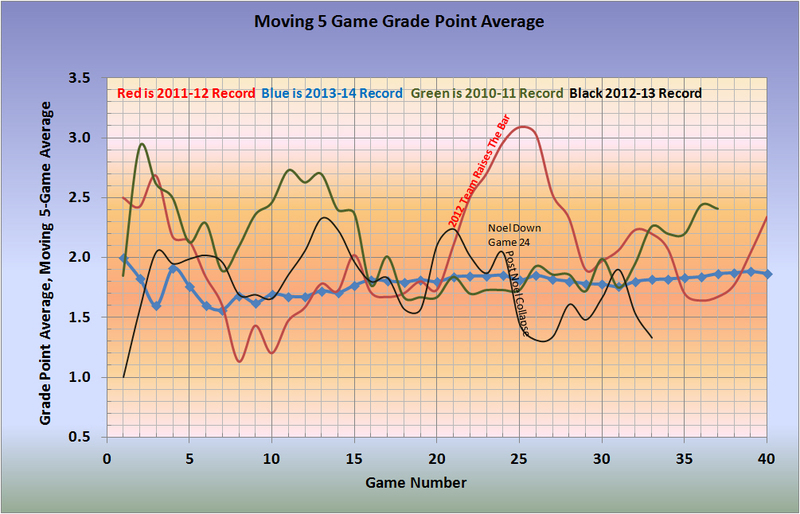 The emerging blue curve represents the current season through its first 9 games. I encourage the reader to ignore the absolute values of the vertical axis on this graphical representation, and focus on the trends the curves reveal and the relative separation of the curves from the central values of 2.0 on the vertical axis. These curves represent a moving average comparison of the teams' performance levels as measured against the NGE model projected performance levels. When the teams out performed the projections over a running 5 game sequence, the value is above 2.0 and when the teams underperformed the NGE projections over a running 5 game sequence, the value is below 2.0. The magnitude of the separation of these curves from 2.0 speaks to the strength or weakness of the deviations. Each of these teams hit an early season performance valley between games 7 and 10. Each of these teams responded to those relative low points by climbing out of those valleys to find early season peaks between games 12 and 15. Each of these teams experienced a second dip following game 15, seeming to hit this second relative low point between games 16 and 19. Beyond game 20, each of these three teams established their own course, their own identity.  The Brandon Knight team stabilized, albeit at the below average level, for the remainder of the regular season before taking off during that post season. That post season run culminated in the program's first NCAA Final Four appearance since 1998.  The Nerlens Noel team elevated its performance level to an average or slightly higher than average level until Nerlens Noel went down. Thereafter, that team lost its heart and soul, lost its confidence about winning in Nerlens' absence, and plummeted into its crash and burn finish.  The Anthony Davis team took off like a rocket ship after game 20, raising the bar that all of its opponents must clear to be competitive with that eventual champion. Yes, my Big Blue brothers and sisters, it is discouraging to watch our team get pushed around, out hustled, and have their collective rear sides handed to them by Baylor (or Indiana; or North Carolina; or Louisville; or Michigan State), but it is much too early to reach conclusions about how this team, this season will play out. This analysis demonstrates that Calipari's Kentucky regular seasons have three segments. In the first 1/3 of a season, these Calipari teams, and the coaching staff, are struggling to identify the individual player strengths and weaknesses. The Coaches are learning about their players, a process that is necessary when each new team consists of essentially all new players, because the coaches need to learn how the players perform individually and collectively. In the middle 1/3, the team (not individuals any longer) and the coaching staff work to define the identity of the team that can produce the strongest finish in March. This middle third of the season coincides with the semester break, which Coach Calipari uses effectively to intensify each teams' focus. In the final 1/3 of the season, the team has the responsibility to consolidate its gains (lessons) and put their unique stamp onto the Kentucky team they represent. In this phase, the Coaches roll shifts to encourager and mentor, rather than task master and teacher. In March and April, the Calipari teams show the world what they have accomplished and learned along their journey. This process is emerging from the Calipari era and differs from the traditional model that allows a player to develop over a period of 2 or 3 years after which a player can emerge as an upper classman who has learned how to play this game. For that reason, each of Coach Calipari's teams must compress that entire traditional process from 3 years into 3 months. No two groups will traverse this path with identical results, either during the process, or in the post season. As fans, we must be patient and supportive of the process, more so than the actual results. Therefore, as of December 7, 2013, there is very little we can say about how this particular team will end its season. The process is really just beginning, and as interested observers, we will not have any idea how the 2013-14 team will write its final chapter until we see this team perform in games 21 through 31 at the earliest. The imprint of the first nine games on top of these three benchmark seasons cannot justify connecting any dots today about March or April. The team that experienced the deepest valley in the first third of their season was the eventual champion 2012 team. The 2013 Nerlens Noel group hit a low that was above 2012's low, yet below the 2011's early season valley. The Nerlens Noel team could have finished at least as strong at Brandon's group, and some have argued it could have finished even stronger. However, when Nerlens' season ended in injury, his teammates did not believe in their ability without his presence. At worst, there is no correlation between the depth of the early season valley and the outcome in March. At best, the teams that experience the deepest of these early season valleys learn their lessons best and respond to Coach Calipari's teaching best, and it shows in March and April. There is not enough data with only 3 seasons, and a 4 th underway, to know if there is a relationship such as this, but there is enough data for Big Blue Fans to take solace that this team has not written its final chapter, and will not do so until March Madness arrives.